Americans are in the dark about the near-global warfare being waged in their name. Overseas, the United States is engaged in real wars in which bombs are dropped, missiles are launched, and people (generally not Americans) are killed, wounded, uprooted, and displaced. Yet, here at home, there’s nothing real about those wars. Here, it’s phony war all the way. In the last 17 years of “forever war,” this nation hasn’t for one second been mobilized. Taxes are being cut instead of raised. Wartime rationing is a faint memory from the World War II era. No one is being required to sacrifice a thing. Now, ask yourself a simple question: What sort of war requires no sacrifice? What sort of war requires that almost no one in the country waging it takes the slightest notice of it? America’s conflicts in distant lands rumble on, even as individual attacks flash like lightning in our news feeds. 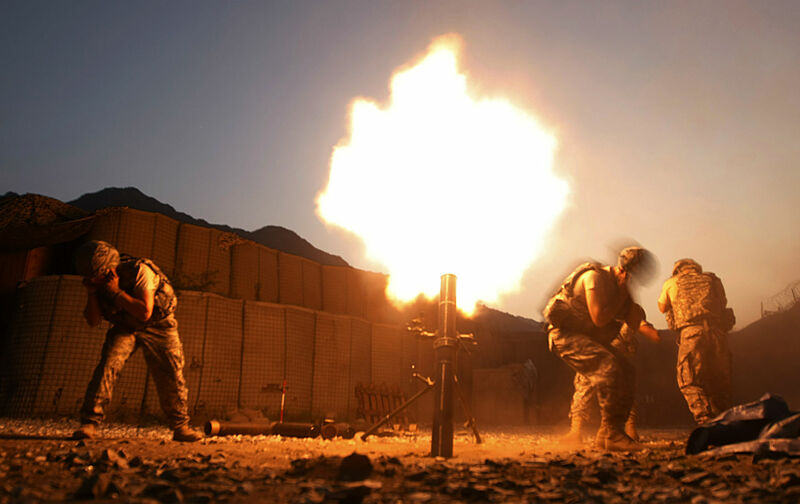 “Shock and awe” campaigns in Afghanistan in 2001 and Iraq in 2003, initially celebrated as decisive and game changing, ultimately led nowhere. Various “surges” produced much sound and fury, but missions were left decidedly unaccomplished. More recent strikes by the Trump administration against a Syrian air base or the first use of the most powerful non-nuclear weapon in the US arsenal, the MOAB super-bomb, in Afghanistan flared brightly, only to fizzle even more quickly. These versions of the German blitzkrieg-style attacks of World War II have been lightning assaults that promised much but in the end delivered little. As these flashes of violence send America’s enemies of the moment (and nearby civilians) to early graves, the homeland (that’s us) slumbers. Sounds of war, if heard at all, come from TV or video screens or Hollywood films in local multiplexes. We are, in fact, kept isolated from Washington’s wars, even as America’s warriors traverse a remarkable expanse of the globe, from the Philippines through the Greater Middle East deep into Africa. As conflicts flare and sputter, ramp up and down and up again, Americans have been placed in a form of behavioral lockdown. Little more is expected of us than to be taxpaying spectators or, when it comes to the US military, starry-eyed cheerleaders. Most of the time, those conflicts are not just out of sight, but meant to be out of mind as well. Rare exceptions are moments when our government asks us to mourn US service members like Navy SEAL William “Ryan” Owens, killed in an abortive raid President Trump ordered in Yemen in early 2017 in which children also died (though that was something just about no one here even noticed). While the military has been deploying and striking on a global scale, we’ve been told from the very first moments of Washington’s self-proclaimed war on terror to go shopping or to Disney World and let the experts handle it. A bizarre version of blitzkrieg overseas and an even stranger version of sitzkrieg at home could be said to define this peculiar American moment. These two versions exist in a curiously yin-yang relationship to each other. For how can a nation’s military be engaged in warfare at a near-global level—blitzing people across vast swaths of the globe—when its citizens are sitting on their collective duffs, demobilized and mentally disarmed? Such a schizoid state of mind can exist only when it’s in the interest of those in power. Appeals to “patriotism” (especially to revering “our” troops) and an overwhelming atmosphere of secrecy to preserve American “safety” and “security” have been remarkably effective in controlling and stifling interest in the country’s wars and their costs, long before such an interest might morph into dissent or opposition. If you want an image of just how effective this has been, recall the moment in July 2016 when small numbers of earnest war protesters quite literally had the lights turned off on them at the Democratic National Convention. By its very nature, a real war of necessity, of survival, like the Civil War or World War II brings with it clarity of purpose and a demand for results. Poorly performing leaders are relieved of command when not killed outright in combat. Consider the number of mediocre Union generals Abraham Lincoln cycled through before he found Ulysses S. Grant. Consider the number of senior officers relieved during World War II by Gen. George C. Marshall, who knew that, in a global struggle against Nazi Germany and Imperial Japan, subpar performances couldn’t be tolerated. In wars of necessity or survival, moreover, the people are invariably involved. In part, they may have little choice, but they also know (or at least believe they know) “why we fight”—and generally approve of it. The definition of 21st-century phony war, on the other hand, is its lack of clarity, its lack of purpose, its lack of any true imperative for national survival (despite a never-ending hysteria over the “terrorist threat”). The fog it produces is especially disorienting. Americans today have little idea “why we fight” other than a vague sense of fighting them over there (Afghanistan, Iraq, Libya, Niger, Somalia, Syria, Yemen, etc.) so they won’t kill us here, to cite George W. Bush’s rationale for launching the war on terror. Meanwhile, with such a lack of national involvement and accountability, there’s no pressure for the Pentagon or the rest of the national security state to up its game; there’s no one even to point out that wherever the US military has gone into battle in these years, yet more terror groups have subsequently sprouted like so many malignant weeds. Bureaucracy and mediocrity go unchallenged; massive boosts in military spending reward incompetency and the creation of a series of quagmire-like “generational” wars. Think of it as war on a Möbius strip. More money shoveled into the Pentagon brings more chaos overseas, more imperial overreach, and undoubtedly more blowback here at home, all witnessed—or rather largely ignored—by a sitzkrieg citizenry. Amid such a plethora of enemies, only one thing is missing in America’s new defense strategy, the very thing that’s been missing all these years, that makes 21st-century American war so phony: any sense of national mobilization and shared sacrifice (or its opposite, anti-war resistance). If the United States truly faces all these existential threats to our democracy and our way of life, what are we doing frittering away more than $45 billion annually in a quagmire war in Afghanistan? What are we doing spending staggering sums on exotic weaponry like the F-35 jet fighter (total projected program cost: $1.45 trillion) when we have far more pressing national needs to deal with? Like so much else in Washington in these years, the NDS doesn’t represent a strategy for real war, only a call for more of the same raised to a higher power. That mainly means more money for the Pentagon, the Department of Homeland Security, and related “defense” agencies, facilitating more blitz attacks on various enemies overseas. The formula—serial blitzkrieg abroad, serial sitzkrieg in the homeland—adds up to victory, but only for the military-industrial complex.